The Joint: Fire & Stone, 31 Maiden Lane, Covent Garden, London, WC2E 7JS. You can find their website by clicking here. 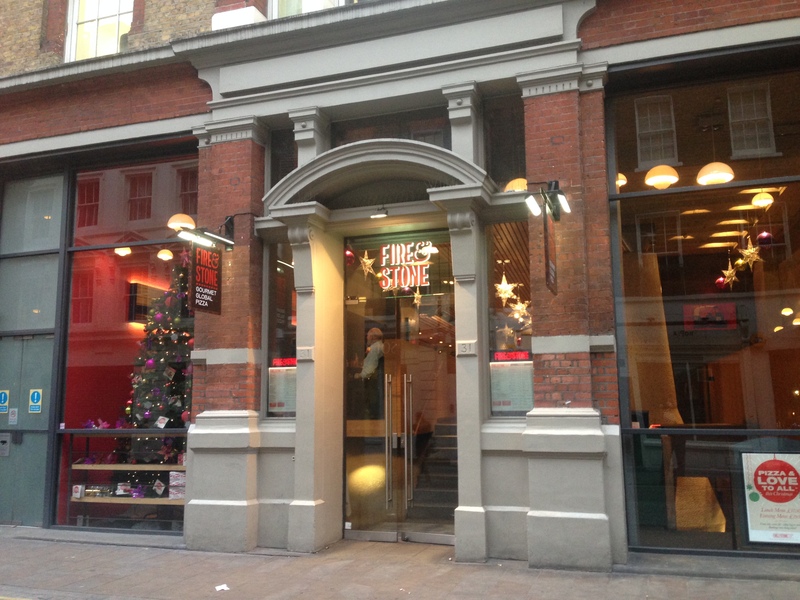 The Vibe: Fire & Stone​ have been serving inventive pizzas in the heart of London since 2006. Their flagship joint in Covent Garden is a short walk from the area’s famous markets and away from the throngs of tourists stood around with their selfie-sticks at the ready. The joint is classy, large, and probably the ideal date location should you need to entertain a partner. We’re not here for a piece of romance though…it’s the pizza that has caught out attention. With pizzas based on famous areas you can grab some dought with a taste of Cape Town, Canberra, or Mumbai thrown in to name but three. From there you can add or remove toppings until you’ve found your match, though we appreciate that doing this isn’t exactly unheard of for a pizza joint. We’re here to sample their Christmas menu though and head straight to their imaginatively titled Christmas Pizza. The Fire & Stone christmas pizza brings you a 12″ thin crust pizza covered in roasted turkey, sausage, apricot and sage stuffing, crispy bacon, rosemary covered roast potatoes, brussels sprouts, and sweet cranberries. It’s a mouthful to repeat and a huge amount to work through. We’re always up for the challenge though and this combination works really well on a pizza. You’ve got all the excitment of a full Christmas lunch with the added bonus of a pizza to wrap it up in. It’s also the first, and probably not the last, time we’ve had roast potatos on a pizza. We’re in carb heaven here. Now the Christmas pizza, with its mountains of meat, isn’t ideal for our vegetarian or halal readers so we stepped up to the plate and also ordered a Tokyo pizza. This oriental explosion comes with chilli & lime prawns on a sweet chilli base, vegetable stir fry with egg noodles, spring onion, coriander, and sesame oil. Again this is an impressive mound of food but one that, to it’s credit, works really well. 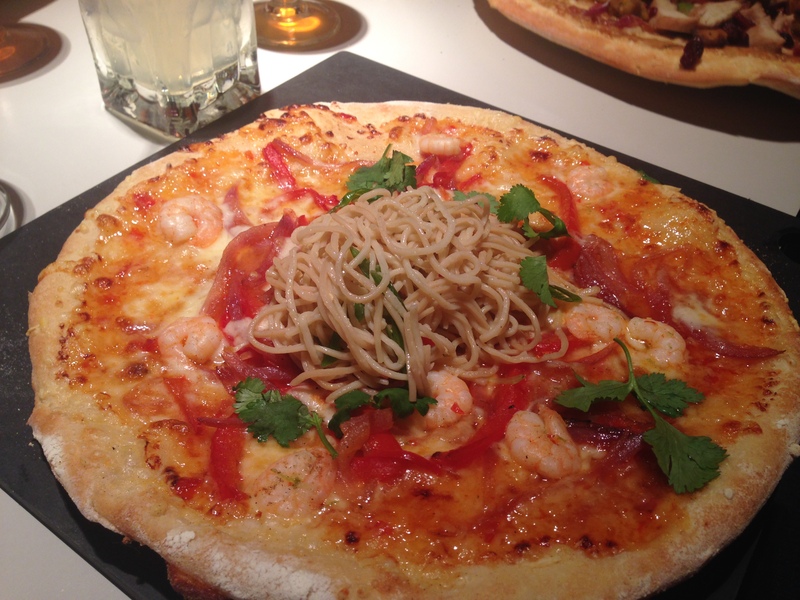 You’ve got all the rich flavours of a prawn stir fry combined with a filling pizza. If that’s not enough for you then we ordered a side of rustice polenta chips and tomato salsa. 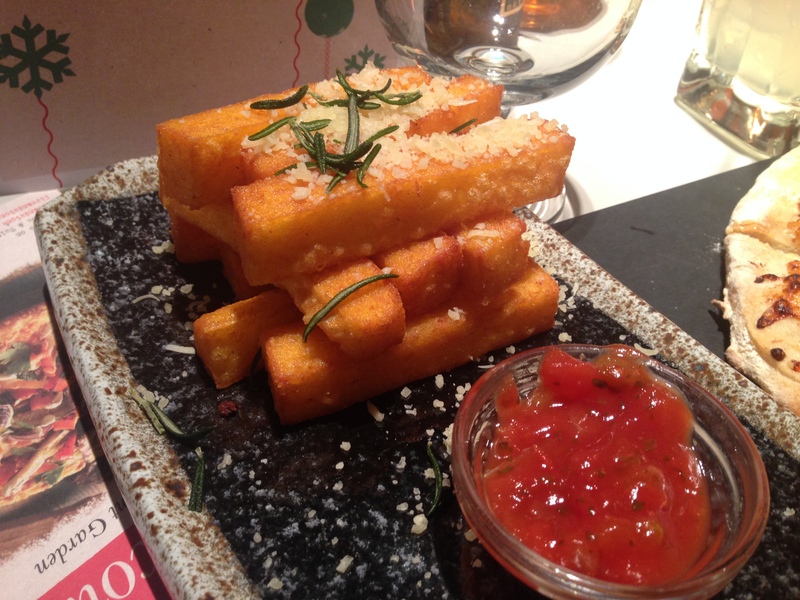 Visually quite striking and a great alternative to your usual fries / chips. 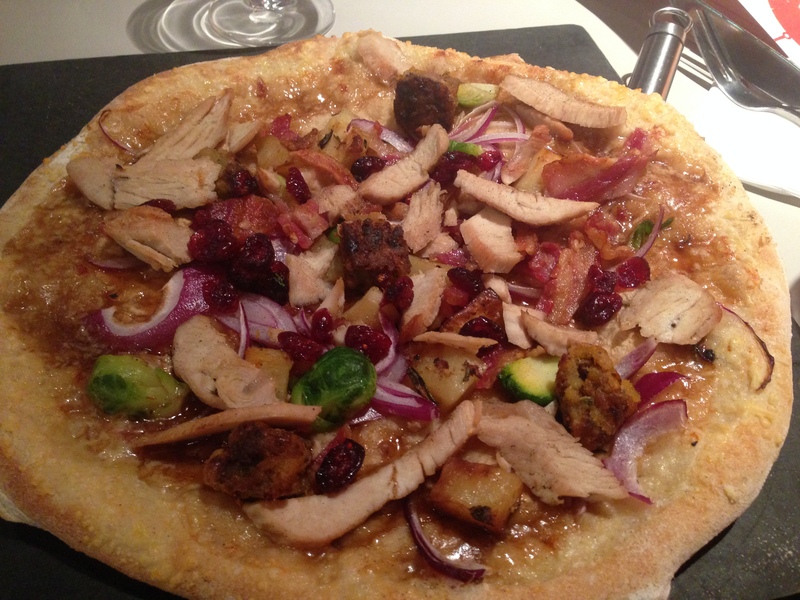 Fire & Stone’s Christmas pizza is great value, stacked with festive toppings, and a fun way to end our year. Merry Christmas from everyone at Out For Lunch – we look forward to bringing you the most exciting ways to break your calorie limits in 2015. The Price: £10.95 for the Christmas pizza, and between £7.50 and £13 for their regular menu pizzas. Fire & Stone was visited by Tom in December 2014. Posted in LondonTagged bacon, christmas, christmas pizza, covent garden, cranberry, eating out, fire and stone, Food, London, lunch, pizza, sprouts, stuffing, turkeyBookmark the permalink.